At Back to Life Chiropractic we strive to deliver the most scientifically supported, patient specific treatments. 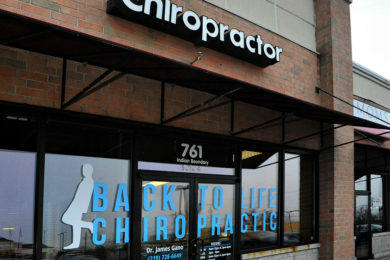 Back to Life Chiropractic, located in Chesterton, Indiana, is a non-invasive form of healthcare that utilizes hands-on treatment to alleviate a specific pain generator(s). Our treatment then goes one step further to address the aggravating factors in order to reduce the likelihood of a future flare-up. Doctors of Chiropractic combine a patient’s medical history with orthopedic/neurological testing, range of motion testing, and palpation of joints/muscles to determine an appropriate treatment. Many times chiropractic manipulation is utilized. This can range from very low force techniques in which no cracking or popping is warranted to utilizing an activator, drop table, or isolated traction (flexion and distraction) techniques. Depending on the specific case, a manual adjustment will be used to help achieve proper biomechanical function of the joint in which a gas is often released (cavitation). This is a controlled adjustment at a specific segment of restriction and most times offers relief. If any concerns arise please let the doctor know and alternative treatment options will be discussed. The safety and efficacy of chiropractic care has been proven. Often times adjunct therapies will be used to help aid in pain reduction, increase range of motion and most importantly increase function. 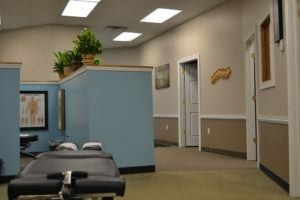 We utilize active care (stretching, strengthening) and passive therapies (manual therapy/massage, electrical muscle stimulation, ultrasound, kinesiology tape) in which chiropractors have extensive knowledge and training. Our only goal is to get you back to doing the things you want and need to do even if that means going to a different professional to help address any non-responsive issues. We send out for all pertinent information from your referring doctor and get any imaging medically warranted to help us get to the root of the condition. Why treat the symptom when the problem can be corrected? Our mindset is always to start with the least invasive treatment to get to a solution then we work up from that point when necessary.